Get the Amazon Fire TV Canada Edition - Review + Buying Guide! This post gives you the most amazing tip to get the Amazon Fire TV Canada Edition. It also reviews the Amazon Fire Stick and gives you option to buy your favorite streaming tv stick. Amazon has jumped to the fray quite late in bringing TV streaming to everyone’s home in Canada. And, the one we talk here, is the Amazon Fire TV Stick Canada Edition that is budget oriented and made for people that need convenience and ease in streaming or watching media on their TV. 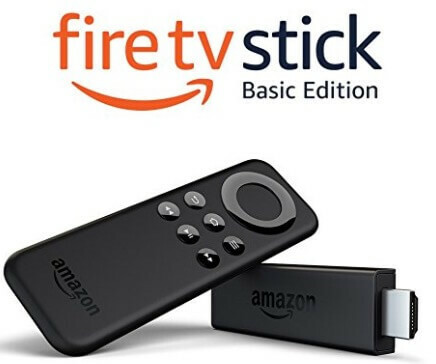 The Amazon Fire TV stick has been a runaway success across the world in USA and nows it’s time for the people of Canada to get the Amazon Fire TV Canada. The device as a whole is completely flawless. The performance on the Firestick Canada is quite snappy and fast, and the voice feature, including the interface is quite good and a different change. If your want to buy the Amazon Fire TV Canada Edition, read our post below. The app section is also a delight, with more than thousands of app on the Amazon Store. Coming to the misses, the voice search feature was a bit disappointed as the firestick device worked quite well, while sometimes it became difficult to fire the correct feature on screen. Also, even though we have a descent app collection on the Amazon Store, many android TV apps available on Google Play is missing from the list. Let’s quickly dive deeply and review the Amazon Fire TV Canada Edition. Here, we are reviewing the basic Amazon Fire TV Stick, made specially for the Canadian region. Everyone knows the Amazon Fire TV Stick, and how it resembles. It is a HDMI powered device, looking just like your portable pen drive. The Firestick Canada is about 3 inch in length x 1.1 inch in breadth and about 0.5 inch in width. This makes it very compact and can fit easily in hand-bag, in case you plan to carry your Amazon TV Firestick along with you on your holidays. The Firestick directly fits into the HDMI port of your TV, and you do not need a TV box or a set-top box to access your media from Amazon. We note here that the HDMI output is quite bulky and does not offer a snuggly fit to your television. Luckily, Amazon provides a small male-to-female HDMI cable that you can use to fit it comfortably to your television. Moving to the other ports, the firestick provides a micro USB port on the side, through which you can power the device, by connecting it to the power port. 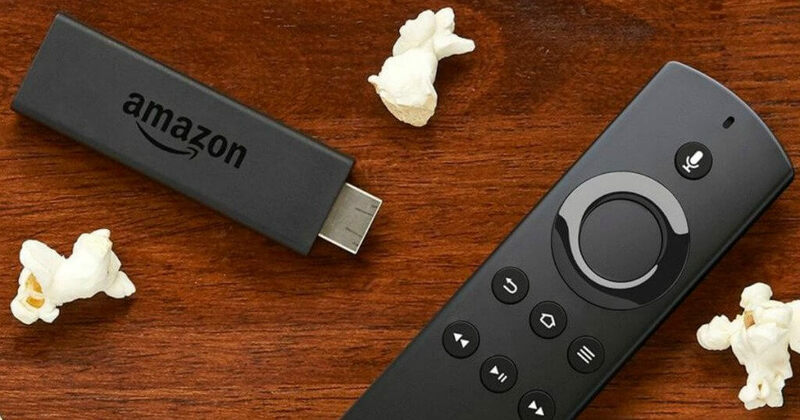 You can also use the USB cable and connect it to your television that will supply power to your Firestick through USB. To satisfy both the conditions, Amazon has provided a long USB cable and a power adaptor, depending on how you wish to power your Firestick. The hardware of the Amazon Firestick is more refined than the previous version. You now get a Quad-core from Mediatek 8127D, with 8GB internal storage and 1GB of RAM. The specs are quite descent and a welcome upgrade from the previous edition. You also get a faster 802.11ac standard wifi setup for faster streaming and buffering of content. In addition, you get bluetooth 4.1 version and dolby surround support for 5.1. Sadly, you do not get an Ethernet port, in case your fails or for more fast internet connectivity. Another disappointment here is the resolution. The Amazon Firestick simply supports playing of media content upto 1080p and non-HDR streaming device. You will have to make do with full HD playback, in today’s 4k times. On the software front, the Amazon Firestick runs an optimized version of Android 5.1. You also get Alexa as assistance. Here, we felt that Amazon should upgrade their software, with the latest and stable Android 7.1.2. The highlight of the Amazon Firestick is the remote, which is the biggest change from the first version of the firestick. You get the standard 4-way navigation buttons to access the menu and the typical 6 buttons to control various aspects of entertainment on your television. An important addition here is the presence of the voice controlled button that you can use to activate and Alexa – the AI powered assistance by Amazon. You can search and activate the exact show or app you need, just by saying out aloud, without having to touch the keyboard or press any button. You can also activate the Firestick TV remote on your smartphone, that gives you the flexibility of using a complete on-screen keyboard than the remote. You can also check out the review about Best Android Tv Remote Control App – Replace Your Remote Now! However, here the major most annoying part is apps that support the Amazon keyboard worked well, while for the rest we had to use our remote. Coming to the app section, you will find many streaming apps like Netflix, Amazon Prime Instant Video, Hulu, Sling TV, Dish Now, etc. so that you can truly enjoy your entertainment needs to streaming from anywhere in the world through the Firestick. The screen is nicely organized with the Home, Movies, TV Shows, Apps & Settings section, making it easy for everyone to use and navigate across sections. You can also check out the wireless keyboard for your Amazon Fire Stick Canada. Click here for more updates. The Amazon Fire TV Stick Canada symbolizes it name of being on fire in terms of performance. The hardware and software on the firestick is very snappy and fast. We could easily navigate on the menus and access the apps with ease and was quick. The apps also opened swiftly. The UI of the Amazon Firestick was sleek and fluid. It is very intuitive and the menu icons are laid out quite well on screen for everyones liking. The last accessed shows and apps are shown on the menu, you can scroll upwards to access the other apps and contents. Coming to the search feature, we liked the Alexa feature, where we could easily say out the program name and the corresponding show would directly play on our Amazon Prime TV or Netfix. The process was very simple and direct. The response from Alexa was also quick and fast, making it very loved for everyone, including our seniors. A frustrating point here is that you could only find direct content from very few apps, using the quick search or voice search feature. If we want to view content from another app, say BBC iPlayer, then the Amazon Firestick didn’t show any result. To view the content, we had to go to the app, open the app and then find the content inside the app, rather using the universal search functionality of Firestick. Additionally, Alexa or the search feature could only understand the program’s name rather the exact show name. It still needs a lot of work from Amazon in enhancing the capabilities of Alexa of providing information, which we rarely would stream. Overall, the performance of Alexa and the search functionality was quick, fast and accurate in most our searches that we performed. You can also use the voice commands to play, pause, or ship shows on the television. Coming to the streaming feature, the Amazon Firestick plays online media quite well. The streaming on the wifi was fast, while there was no drop in quality. We could enjoy our Netflix episode in full HD, with less to no amount of buffering. The H265 codec does a great job in compressing data over the internet. You do not get the Google PlayStore on the Amazon, but the Amazon-alternative store that houses most of the apps, relevant for your streaming and viewing media online. You do not get YouTube, but can access similar apps using the web browser. Note, even though the Amazon Firetsick is based on the Android, you cannot install apk on the fly. You will have to sideload apps, which is very technical for a lay person, and there is a chance of bricking the device. Hence you cannot enjoy Kodi or the IPTV app on your Amazon Firestick. So you will have to make do with the available apps, which we feel are enough, to satisfy your streaming and entertainment needs. We loved the interface on the Amazon Fire Tv Stick. It was fast, fluid, simple and very snappy. The UI is made for everyone, with clean and intuitive looks. Finding and accessing content was very easy. After we get our content, the playback was quick with minimal buffering and true to its name of doing the job of a best streaming device. The picture quality was also great and the dolby sound was pleasing to the ears. We also loved the Alexa-powered voice search and control feature. The service was quick and accurate in playing our streams from Amazon Prime Video and Netflix. We still waiting for Amazon to support other famous streaming apps. Most importantly, the product is made in USA, and not a chinese knock-off with Amazon branding and support. You also get a 1yr warranty, in case something goes wrong. You never may go wrong with the Amazon’s trust. Coming to cons, one aspect was the lack of 4K video playback. You can however enjoy a full HD resolution output for any media that is played. Also, you do not get the complete collection apps available on Google PlayStore. You do not get Kodi or the IPTV app to enjoy streaming. Alexa is very powerful, but sometimes showed false results for few searches. Also, you can only open content from Amazon Prime TV or Netflix, and the voice support is not active on other streaming apps. You will have to open the app and access the content. Overall, we loves the Amazon Fire TV Stick with Alexa voice support. We love Amazon and trust its device. The TV streaming stick is a solid device that is very portable and easy to use. It helps watch Netflix & Amazon Prime content with ease, and we loved the overall output. We have good news that the Basic Amazon Fire Stick is available on Amazon.ca. You can buy and check price here. If you want to buy the more advanced version of the Amazon Fire TV Stick, that is the Amazon Fire TV, then you need to perform certain more steps to get the ultimate device. Officially the Amazon Fire TV is not released in the Canada region. The steps mentioned below will not only get you a better deal, but also give you a much ease of mind in dealing with ordering TV devices from USA. You need to create an account at a USA forwarding website that will give you a USA mail box. These company will give you a virtual USA address, where you can then go and buy the Amazon Fire TV from Amazon.com and specify the USA address. The forwarding company will then ship the product to your Canadian address. Few of USA mailbox are ShipToTheBorder, MyUSAddress, MyUS. Go to Amazon.com – Amazon Fire TV and at checkout enter the USA address that you received. Once you have placed the order, go to the mailbox account and add your Canadian address. Keep tracking your order status, to see when you will receive the order to your house. The cost is all displayed on the website and the site are the better option to get your Amazon Fire TV to Canada. Another alternate option is to order the Amazon Fire TV to your friends or family address in the USA and ask them to ship them to your location. Here, again you will have to pay for shipping to ship to your Canadian address. Another interesting option is to drive to the States and pick up one of the Amazon Streaming device from the Walmart store or any other local retailer. The above method is legit and completely legal to own an Amazon Fire TV in Canada. However to note here that it includes around $15 to $30 extra to ship the product to your Canadian address. Also, you need to cough up extra in US to Canadian dollar conversion. The above cost makes it a difficult option, specially when you can own an Android TV Box, that is much more powerful than your Amazon Fire TV Stick. You can get specifications and features with Kodi and IPTV app that you can find only in an Android TV Box. You can find more better android tv boxes that is more rich is features and less on cost.